After the experiences with Pup I have looked at another part of the Meteor world. VulcanJS is not a boilerplate, but sees itself as a whole framework. Starting with the cloning or forking of the vulcan-starter repository. Afterwards the necessary npm packages will be installed as well as with Pup. The standard functionality of VulcanJS is significantly lower than Pup – so the installation is much faster. It takes less than 4 minutes for the Vulcan tutorial to be locally available for the first time – which is a bit more than half the time of what Pup needs. However, there is a problem with the installation immediately: npm’s automatically running audit reports three vulnerabilities classified as “high” in the used libraries. In any case, the app should not be set productively in that form. However, the problem has now been resolved and a simple solution provided . In the current version 1.12.13 the problem has already been fixed. The Vulcan-starter repository contains several tutorials that explain step-by-step how to use VulcanJS. Each tutorial runs locally as a meteor application and describes each step directly in the browser. If the mentioned files are changed accordingly, the website is updated automatically and the tutorial continues. This makes it clear which change is causing what. Related adjustments, even across multiple files, are sometimes explained with alternative solutions. This makes the underlying system easier to understand for the user. VulcanJS has been in development for several years. The name Vulcan is only used since version 1.3.2 – previously the framework under the name telescope nova was rather unknown. Originally started with the Meteor version 0.8. In order to get to the current state, the framework had to implement many refactoring work. In some places this is still noticeable. Not all tutorials adhere to current Meteor Guide rules and not all videos match the descriptions and the associated source code. But that does not matter much, as these tutorials will are updated bit by bit. All in all, the tutorial leaves a safe, though not too deep, impression of the feature rich framework. A direct comparison with Pup is not entirely acceptable, as the template and framework are targeted at different audiences and applications. At Pup you get a starting point for a working app. At VulcanJS, on the other hand, you get the tools needed to do this, including an enrollment. When developing a new app both approaches can be followed and here I would like to respond to the differences. If you have started a project with Pup, then the current version of the boilerplate will inevitably be used as a basis for the project. A later update of this basis is relatively difficult, because you changed exactly this boilerplate for your own purposes. This is different with VulcanJS. Your own application is developed from the beginning as a package, encapsulated from the framework. As a result, an update to a new version of VulcanJS can be performed easily and the code can be adapted to any changed functionality faster. If you need more profound changes in the process, VulcanJS offers different entry points in your own packages – so-called hooks. How to understand this package-based architecture is explained in the documentation. Furthermore, VulcanJS differs from Pup in the choice of packages used. Instead of Bootstrap or Fur, the styling is not bound to any particular library. Instead, the user can choose what fits. The separation between modules and UI elements with the extension .jsx in the file name is also helpful. Instead of the graphQL Playground in Pup, VulcanJS uses the graphiQL IDE to access the graphQL API. Instead of prepared and separately stored resolvers, mutations and queries at Pup, VulcanJS explains what makes a resolver and collects related data together. The initial database filling with random values ​​that was implemented at Pup with the in-house Seeder Package is missing from VulcanJS. Start values ​​are created here only statically – the contribution of a random component or interdependent data must be implemented by yourself. VulcanJS also provides simple support for multilingual text output with the I18n Package. Basically I can say: The further and more limited the functionality of the app to be developed has already been specified, the more I would advise to use Pup. If the requirements are rather vague or if the skills in handling Meteor are not yet established, we recommend the use of VulcanJS. A good start is half the battle.. Such or similar statements also apply to the development of web applications. Anyone who starts with the right tools, in a suitable environment and with a solid foundation, may later not have to tediously restructure the app. Design patterns and best practices in general are often taken very seriously in boilerplates, giving the developer clear guidelines. With this mindset I have looked at the “Ultimate Boilerplate for Products” Pup from cleverbeagle.com. This is a template for the development of a web application based on Meteor, React, MongoDB and GraphQL. Subsequently I want to answer the question to what extent boilerplates help us with the development of prototypes and when they may actually hinder us. What does Clever Beagle’s Tool Pup have to offer? This list is constantly being expanded, as Pup always strives to relieve the developers even more and cover more areas through this boilerplate. For many websites a static site is absolutely sufficient. They offer a number of advantages: Undemanding hosting, secure against malicious content changes, short loading times. Various tools are available to generate these static pages. One of them is Gatsby, which is characterized by the optimization for low latency by creating the website as a so-called progressive web app: The first time you open it, only the required content is loaded to display the page. Further information is then saved in the browser in the background, so that further page changes are possible without waiting time. Other innovations of the last years are used as well: React as component-based framework for the user interface, GraphQL as query language, Webpack for the bundling. In addition to static files, external sources or CMS can also be used for the content via APIs. qnipp has built an atlas showing the childcare facilities of the Austrian state Burgenland using Gatsby (Kinderbetreuungsatlas der Arbeiterkammer Burgenland). He showed at the Linuxwuochen in Eisenstadt and Vienna the possibilities and shared his experiences. App development divides the developers into three groups: The iOS developers, the Android developers and the group of developers, who try their best using Apache Cordova (former PhoneGap). The first two groups concentrate on own mobile OS, the third tries to build platform-independent apps. The latter one leads to disadvantages, as only a browser component is used. React Native – an Open Source framework created by Facebook – tries to combine the advantages of both worlds: Instead of different languages only one is used, but the created programs use native UI components and do not have to hide behind the native app in terms of performance. Franz Knipp showed at the Linuxwochen in Eisenstadt the first steps to create such an app und spoke about his experiences. How would an economy look like, where the primary objective of economic activity is not the money, but the common good? Following this questions I created my first common good bilance for my company qnipp – not alone, we’ve been a group of four entrepreneurs, who discussed the topics of the economy for the common good. We rated our companies in the fields of human dignity, solidarity, environmental sustainability, social justice, democratic participation and transparency. We thought of the supply chain, the funders, the staff, the customers and the social environment. Finally, a score is determined using a matrix, which is evaluated by an external auditor, who creates an official certificate. You can find an English translation of the matrix here. So, I reached 483 of 1.000 points. For me, the score is not as important as the confrontation with the theme and the detection of fields for improvement. 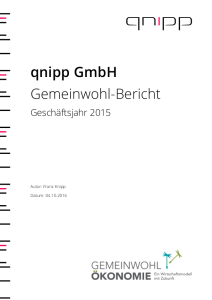 The Common Good Bilance (available in German) gives a deep insight into the company qnipp as well as into my role as founder and CEO. It is our first step towards Corporate Social Responsibility. 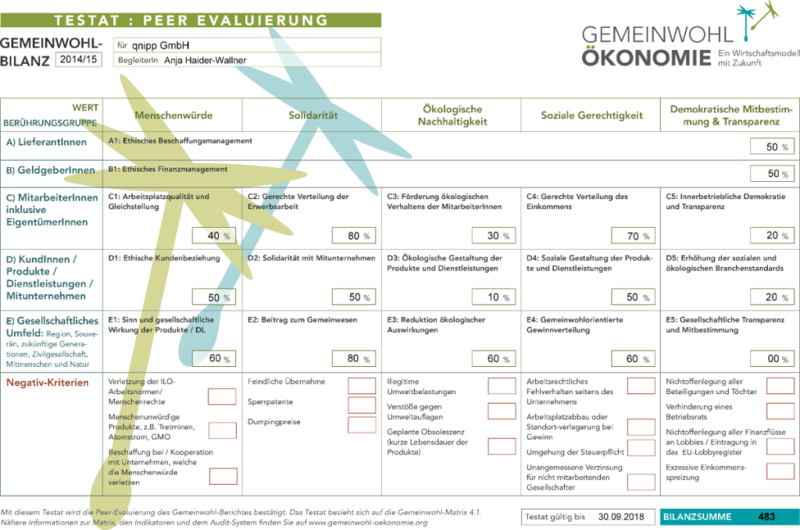 If you want to find out more about the economy for the common good, visit the website www.ecogood.org, which is also available in English. Meteor downloads all the packages in the user directory in ~/.meteor/packages. There is no command to clean up this directory, as Meteor doesn’t know the dependencies of all the applications on your computer. This will delete all but the newest version of every package. If an application needs an older version, it will be downloaded and re-installed by the next start of this application. It saved me 2.5 GB today. The script works very well in Linux, it should work on Mac OS X as well. cd ~/.meteor/packages; ln -sf `ls -d packages/meteor-tool/* | sort -Vr | head -n1`/mt-os.linux.x86_64/meteor . Use all the commands with caution and at your own risk. You want to start a new Meteor project? Instead of starting from scratch with an empty directory and no packages, you could take an existing boilerplate. There’s no official boilerplate, but a number of them are provided by the community. The list contains at least the link to the respective Github page. I haven’t tested them, as I created the list as starting point to find a suitable boilerplate for my next Meteor project. The boilerplate by @matteodem contains the command line utility orion to generate the folder structure for the application. Yeoman is a tool for all kinds of web applications, and Google finds various generators for Meteor applications, e.g. for Angular (very active project) and React. A different approach ist taken by Meteor Kitchen. The complete application including views, models, navigation structure is generated by a single configuration file. Unfortunately, the project is not published as open source (yet). I’m still choosing the starting point. Let me know your opinion by commenting on this post.